Creativity in aisle 4! 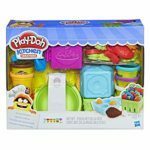 Now aspiring chefs can stock up their Play-Doh kitchen with the most colourful pretend ingredients imaginable. 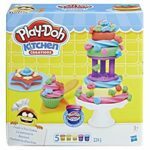 Packed with creative fun, this supermarket set features over 20 pieces, 7 Play-Doh cans and has everything that a chef could need for their next Play-Doh culinary masterpiece. Stop by the Buzz ‘n Cut barber shop for a silly haircut and a shave! Place one of the 2 characters in the chair and turn the crank to grow hilarious hair or a bristly beard. Junior bakers can make colourfully creative pretend treats with their own mixer! With the mixer, 2 stamp attachments, and accessories, there are lots of fun combinations to make. 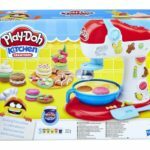 To start, choose a stamp attachment, add some Play-Doh compound, press the handle, and voila – the mixer spins and stamps Play-Doh cookies and crazy cupcakes! 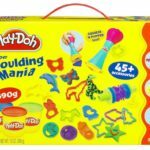 Go moulding mad with this fantastic Play-Doh Super Moulding Mania set! 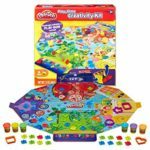 Play-Doh Play N Store Creativity Kit is a big kit of modeling compound and tools lets little explorers play and create. 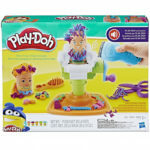 It’s time for a frosting frenzy time with Play-Doh Kitchen Creations Frost ‘n Fun Cakes Set! Aspiring cake chefs can feel like pros with all the right tools to make lots of fun pretend cakes. 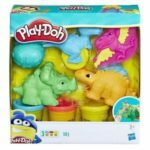 Have fun with 5 Play-Doh tools shaped like dinosaurs. Create your own dinosaur footprints! 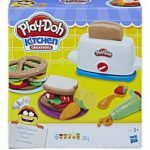 No matter how you slice it, it’s way too much fun to see what kinds of silly sandwiches and other creations kids can make with this Play-Doh toaster and tools! Whether it’s a Play-Doh breakfast, lunch, or brunch, this toaster tool can shape pretend bread slices over and over again.